One thing sure, the oldest document I own is the 1933 postcard from New Mexico. I never owned anything that dates back in the 1800s. Months ago, I accidentally discovered this document from eBay. I don't have any idea about the relevance of the document. What was only clear to me was the year 1840. As I'm typing this, I'm beginning to think that 1840 may not reflect the age of the document because for all I know, I don't understand French. Hahaha With the help of Google translator, I was able to understand the label inserted. 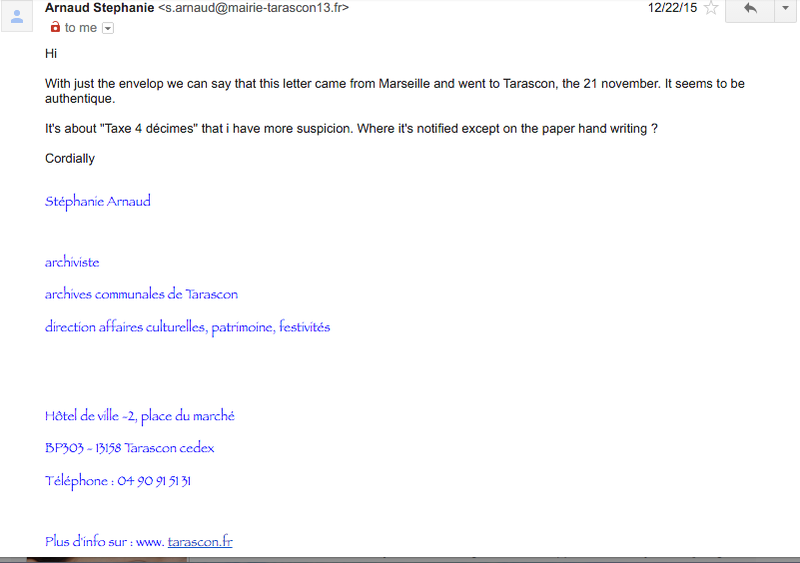 Initially, I thought Marseille Tarascon is a person. Turns out, the two words refer to places in France.I googled about the two places and discovered that both are situated in the region of Provence-Alpes- Cote- d' Azur. Now, don't ask me to pronounce it. Hahaha The region is situated in the southern coast of France, particularly the Mediterranean coast. What I'm still uncertain of is whether Tarascon is a district in Marseille or the two are separate towns in the province. I'm more inclined to believe on the latter because I found several questions from Trip Advisor seeking to determine the transport means from Marseille to Tarascon. As for the tax decimated, this is another confusing aspect for me. Truth to be told, this is the first time I heard of tax decimated. :P Pardon my shallowEnglish vocabulary. When I tried to find the meaning of decimate, it appears as an act to reduce a significant amount. With this, I can assume that the letter aims to inform the recipient of a possible reduction or discount in his tax. I hope my guesses are correct. The recipient of the letter or the envelop in this case is Monsieur ....... I cannot anymore decipher the calligraphy. Anyone can help? My mistake here is that I failed to ask the seller about the details of this document. I was overwhelmed with the idea that it was something from 1840. Hence, I cannot make a full account of this treasure. My initial plan is to have this framed in transparent glasses and include this as a display in my current nook project. Unfortunately, I have to postpone it until I'm able to complete the full details behind this treasure. I've prepared this post last Sunday because I have anticipated a full work week ahead. More than the questions left in this post, I'm actually more worried about the glitches in my new blog design. I hope the "disabled" menus in Apple mobile devices will be addressed soon. It will look pretty when framed, what a nice collector's item :) I browsed your blog using my phone and Edel is right, the banner wont show completely, and some text are overlapping. Hope it gets fixed soon, dont worry it looks really nice! Parang "Monsieur le Maire de Tarascon". 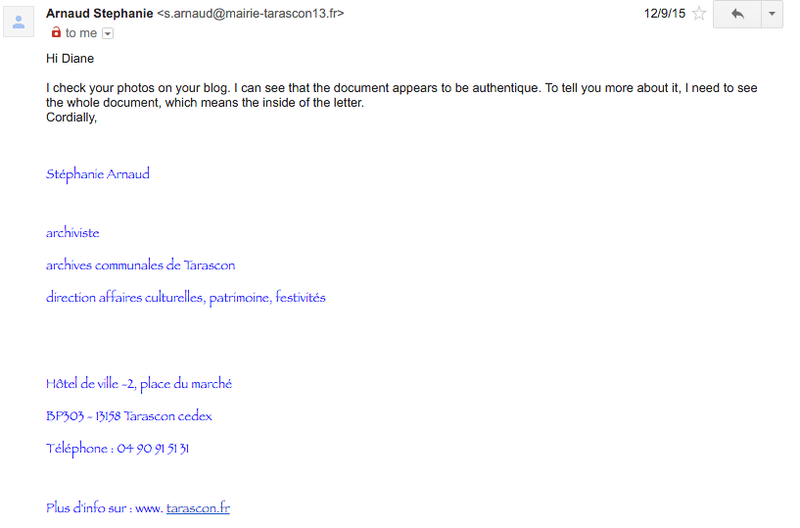 I was initially thinking na "Monsieur le Moire de Tarascon", but the letter after M resembles that after T in Tarascon. What a treasure! Ahhhhh!!!! Diane, it's a letter to the mayor of Tarascon! Wow. A piece of history in your hands! Wow ang galing mo Mother!!! I'm trying to figure out who was the mayor. Unfortunately, accounts in Wikipedia also dates back 1935. Sana mahanap ko. Maybe you can write to the historian of that town? I'm quite excited how this will unfold. Go, Diane!